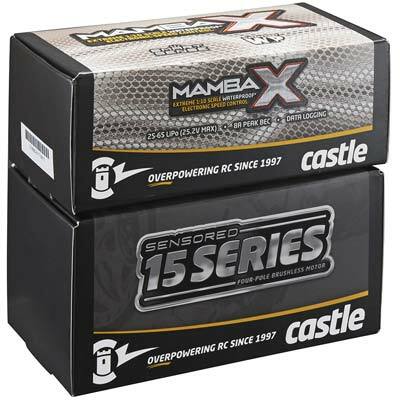 The Mamba X represents the latest and greatest in Castle Creations Inc. ESC technology. Originally designed to overpower 1/10th scale buggies and trucks, the ROAR APPROVED Mamba X also delivers amazing race capabilities for 1/8th scale eBuggy. After being extensively race-tested by Castle Creations' Lead Mechanical Engineer and Team Driver, Taylor James - the Mamba X has been approved for eBuggy racing with two of our most popular 15 Series Motors. 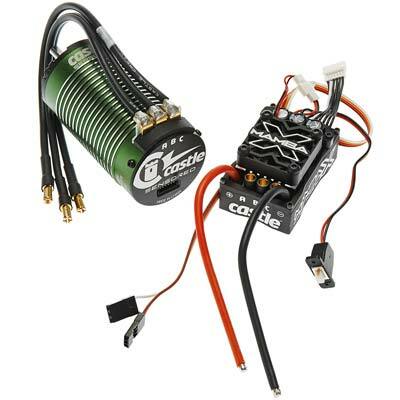 This combo is a Mamba X ESC and 1515 1Y 2200kv motor for lighter 1/8th scale applications. 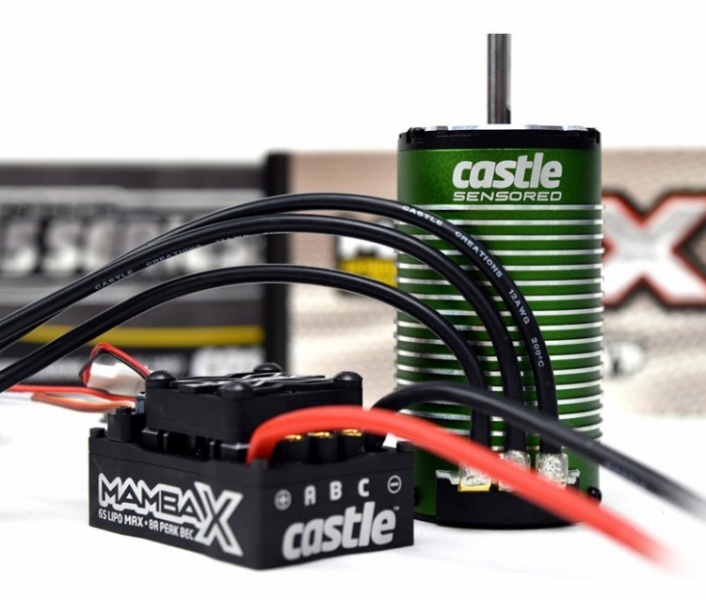 Normally this motor is paired with our 1/8th scale Mamba Monster X ESC; but if you need to save some weight or need a smaller footprint, the Mamba X is more than capable of running this motor. This setup is recommended for 3s or 4s use in a vehicle weighing less than 4 kg and geared for no more than ~72 KPH. If you have a heavier vehicle, looking for more speed or just want to beat the ever loving snot out of your vehicle we would recommend picking up the Mamba Monster X combo (CC010-0145-03). Coming in at just 101 grams the ROAR APPROVED Mamba X ESC packs features that will advance your game as a beginner or an expert on the track. You will POWER THROUGH extreme jumps and accidental collisions as the ESC is housed in a RUGGED CNC-MACHINED ALUMINUM CASE and then potted in waterproof epoxy. This not only protects the electronics but ensures any heat generated in the controller can easily be dissipated through the case. Combined with the IMPROVED 4-POLE 12-SLOT design of the sensored 1515 1Y 2200Kv (Awaiting ROAR approval ) motor, you will experience PRECISE THROTTLE CONTROL and BUTTERY SMOOTH starts, plus the RAW POWER and LONGER RUN TIMES that these highly efficient motors produce. CASTLE’S INDUSTRY LEADING SOFTWARE is the ticket to creating a perfect setup, even before you hit the track. Our latest firmware versions were developed with the top-level racer in mind. They offer unparalleled performance and drivability that will leave the competition in the dust. They also offer useful features to assist in getting the most out of your setup. The Mamba X captures and RECORDS PERFORMANCE DATA via the DATA LOGGING function and allows users to view a detailed record of what the ESC actually experienced during a run. Gearing your 1:8th E-Buggy will be a breeze as the data logging will measure and record the internal temperature of both the ESC circuit board and the motor to give you the most accurate analysis of gearing changes, allowing maximum optimization of both performance and battery life. There is no need to carry a temp gun around anymore. Dialing in to the track has never been so simple with the “ON-THE-FLY ADJUSTMENTS” to be made through the AUXILIARY WIRE on the Mamba X ESC. Once enabled in Castle Link, you can fine-tune your car speed to the track you’re on using the MAX POWER AUXILIARY WIRE MODE. This setting, and several more, are easily accessed right from your transmitter in REAL TIME, WHILE DRIVING! The advantages of being able to adjust your car speed while on the track, without having to physically change gearing, will result in more confidence on the track, despite its condition. The CASTLE sensored motors will catapult your competitive advantage with the use of SMARTSENSE™ and QUIETSENSE™ TECHNOLOGY. SMARTSENSE™ is enabled by default in the Castle programming suite, and will use the motor’s sensors to provide smooth starts, excellent torque, and low-speed drivability. Once the motor is turning, it seamlessly transitions to Castle’s ULTRA-EFFICIENT sensorless mode with ELECTRONIC TIMING. When running, a motor must transition between different load points and a different timing advance is required for optimal efficiency at each. Electronic timing in SMARTSENSE™ will advance timing automatically for peak performance during all driving conditions. This combines the best of both worlds in an unrivaled HYBRID between smooth sensored startups and high-efficiency sensorless running. This makes the Mamba X system produce more power and less heat, which are two ingredients every racer knows to be beneficial. QUIETSENSE™ describes an innovative advancement in the design of sensored motors. It shields the sensors from magnetic field noise through the use of a FLUX SHIELD™ in conjunction with secondary Sense Magnets delivering even HIGHER PRECISION and MORE EFFICIENT startups. In the end this remarkably robust design, combined with the indisputable leading software functionality that Castle engineers are known for, makes for the ultimate powerhouse for your 1:8th scale E-Buggy. Connectors: 4.0 mm female bullets for motor connection. Items Needed for Operation: Battery Connector required; Castle 6.5 mm Polarized Connectors, Castle 4.0 mm Polarized Connectors, Traxxas® Power Connectors, or Deans® Ultra Plugs are recommended. Application Guidelines: Intended for up to 4s (25.2 Volt) operation in vehicles weighing less than 9bs/4kg with 1515 - 2200kv motor. Max. Recommended Vehicle Weight: Less than 4kg, with batteries, ready-to-run. Connectors: 4 mm male Castle Bullet Connectors on 12AWG wire, includes 210 mm length sensor wire. Application Guidelines: Ideal for 1/8 scale off-road and on-road vehicles as well as 1/10 scale 4WD SCT up to 4 kg on 4s LiPo.